Mobie Academy is a completely new kind of electronic learning and training material production and distribution platform, a global online shop, and a very versatile learning environment for educational institutions, teachers, trainers and students. It is an excellent service for trainers who train around the world. The use of Mobie Academy is always free to content providers, publishers, and training organizations (schools, colleges, trainers, etc). 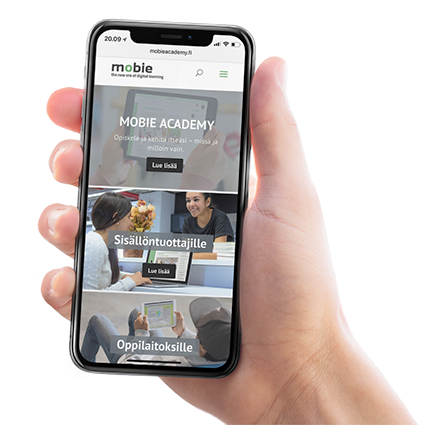 Mobie Academy’s learning environment/production platform is based on the OnEdu learning environment developed in cooperation with a hundred Finnish schools and close to 2500 teachers, as well as on the further development of the eSmart training/orientation system for businesses and organizations. For content providers or publishers, Mobie Academy enables the production of learning or training materials on a very modern platform, as well as distribution and sales of materials globally from altogether 11 countries. A teacher or trainer can set up unlimited number of groups to which she can invite the desired number of students. She can determine which learning or training materials the student should acquire from the online store and see in real time how students work on the courses. The service also includes the possibility of organizing real-time video-lessons. A teacher or trainer can also produce different tasks and course materials. Students acquire the learning/training materials they want from the online store and at the same time access to the personal learning environment for the duration they want. The service also acts as a student’s personal portfolio. She can obtain individual courses from the online store, or participate in the courses of the various training providers for which the teacher or trainer can create and monitor the student groups they want, as well as provide the students with the necessary personal feedback.